The official 1st day of summer (June 21st) is almost here! I'm not sure why, but every year summer seems to fly by and I never get the chance to do everything I had planned. I usually have multiple summer clothing items on my wish list as well, which for the most part never seem to quite make their way into my closet (lack of funds may be to blame here). In honor of summer, here are some of my wish list items...hopefully I will be able to make, do, or buy at least a few of them! This is good to know becuase I thought summer already started lol! 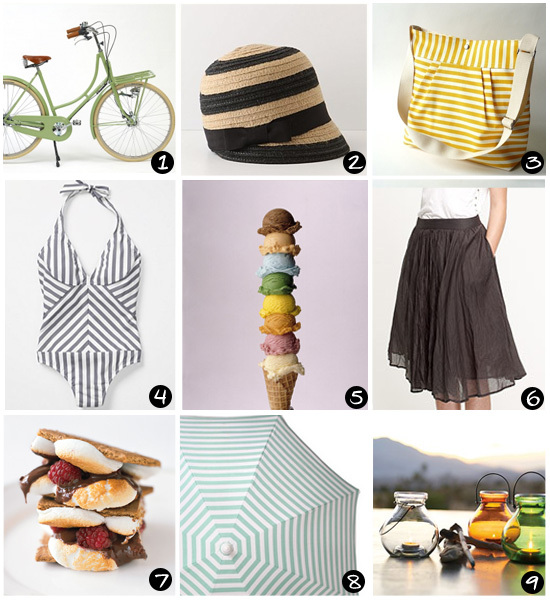 Love that ike beach bag! Good list!! I should put a goal list together for this summer too! adorable summer picks - that swimsuit is too cute!